David A. Sousa, EdD, is an international consultant in educational neuroscience and author of more than a dozen books that translate brain research into strategies for improving learning. He has presented to more than 200,000 educators across the United States, Canada, Europe, Australia, New Zealand, and Asia. He has taught high school chemistry and served in administrative positions, including superintendent of schools. He was an adjunct professor of education at Seton Hall University and a visiting lecturer at Rutgers University. 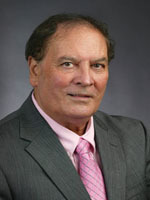 Dr. Sousa has edited science books and published dozens of articles in leading journals. His books have been published in French, Spanish, Russian, Chinese, Arabic, Korean, and several other languages. He is past president of the National Staff Development Council (now Learning Forward) and has received honorary degrees and awards for his commitment to research, professional development, and science education. He has appeared on NBC’s Today Show and National Public Radio to discuss his work with schools using brain research.